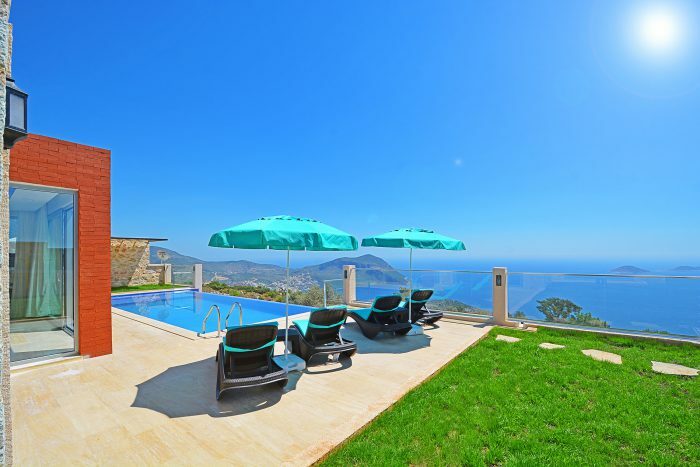 If you’re looking for stylish and comfortable accommodation that looks over Turkey’s breath-taking Kalamar Bay, then let us introduce you to a villa known as Nova. This modern villa boasts the most stunning views that stretch across the beautiful coastline of Kalamar Bay that’s lapped by the azure water of the Mediterranean and backed by soaring mountains. Nova is a beautifully-appointed, two-bedroom contemporary villa that can sleep four guests. Each room oozes luxury and sophistication. An open-plan living room, kitchen and dining room leads to glass patio doors, which takes guests onto a fabulous pool terrace. The twin bedroom with en-suite shower room also leads to the outdoor pool terrace, while the en-suite double bedroom leads to Nova’s inviting indoor pool. As well as an indoor swimming pool, giving guests the choice whether to bathe indoors during the chillier weeks or outdoors when the warm Turkish sun is soaring overhead, Nova is home to a sauna and hammam for true relaxation and self-indulgence. The luxury comfort of Nova’s interior continues to the villa’s exterior, which justifiably makes the most of its enviably elevated position looking down on Kalamar Bay. A barbecue and shaded grassy seated area provide the perfect spot to wine and dine under the clear Turkish sky while looking at the lights of Kalkan twinkle below. An open terrace and the infinity edge pool, which blends seamlessly with the cobalt water below and sky above, means guests can splash about and dry off for a sunbathing session in the most peaceful of surroundings. Nova is perfectly positioned to enjoy the peace and tranquillity of Turkey at its most beautiful while being close to civilisation. Just 4km from the villa is the upmarket yet traditional fishing village of Kalkan and its pretty old harbour, which offers memorable boat trips into the Med and is lined with quality seafood restaurants. Beach clubs are 5km from Nova, the perfect place to spend lazy days on a sun bed, sipping cold beverages of your choice and cooling down by taking a dip in the inviting water. This well-equipped modern villa has everything you’ll need for a comfortable and memorable holiday in what has to be one of the most beguiling and sought-after parts of Turkey. To whet your appetite for Nova further, view photos of this stunning villa and book to stay in 2019 at the property’s webpage here.